Motorhomes are heavy vehicles, even small units will be between 2-3 tonnes. Therefore it’s a bad idea to try and level the motorhome on soft ground, as it won’t stay level for long. Don’t be tempted to purchase cheap levelling ramps. As stated, motorhomes are heavy vehicles. 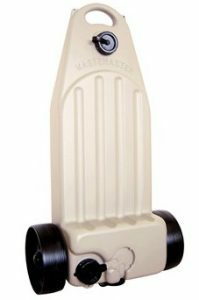 Cheap ramps will break and snap pretty quickly, therefore check reviews before a purchase. Kick the Ramps into Position and Don’t Hold Them! Kick the ramps under the wheels parallel to the tyres. No one should be holding the ramps in position. If the clutch slips or the driver makes a mistake it could have serious consequences. Right, now we have covered the highlights lets go into more detail on how to level a motorhome or camper van on site. As stated above, motorhomes are heavy vehicles. At Horton Common, we have had some very large motorhomes visit us over the years. 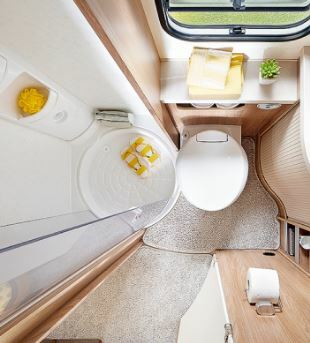 Some of the large A Class motorhomes weigh between 5 to 10 tonnes! 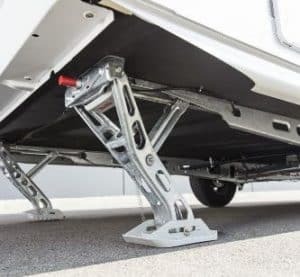 So when it comes to levelling a motorhome of that weight, the ground needs to be firm and stable enough to support the weight. Luckily at Horton Common, we have installed a road and hard standing pitches with 200 tonnes of stone at a depth of 6 to 10 inches to provide a firm stable surface all year round. It’s been tested several times by the 20-tonne gravel wagons that deliver granite chipping for the road dressing. However, not all caravan and motorhome sites have such a firm surface, particularly on small sites. Even more so if you are going to be staying on a grass pitch. 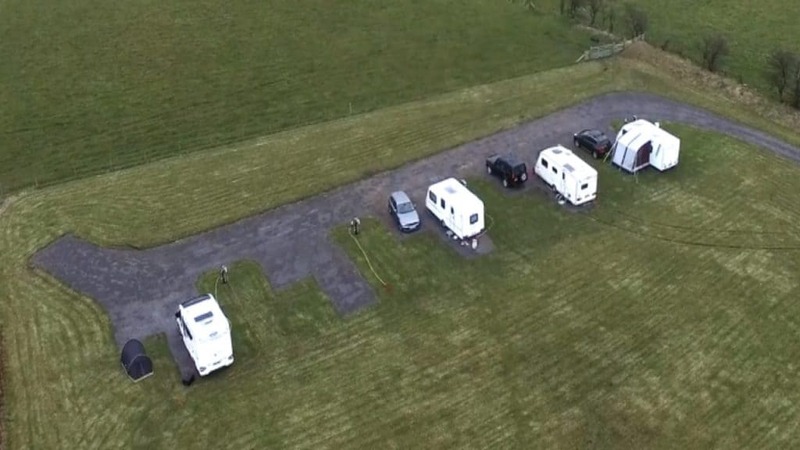 Many of our motorhome visitors state they now only visit sites with hard standing fully serviced pitches. But in some cases, you might not have a choice, and you have to stay on a grass pitch. Therefore try to find an area on the site that will drain well, asking the owner for the best position is a good idea. Let’s consider an example. You turn up to a site on a dry day and level your motorhome. You get the motorhome perfectly level and your pretty happy with the job. Then some typical British weather takes hold, and down comes the rain. The ground becomes wet and the due to the weight of the motorhome you start to sink! Now this will not only put your motorhome off level, but you may also get stuck! Therefore the very first step on how to level a motorhome is to find stable and firm ground. 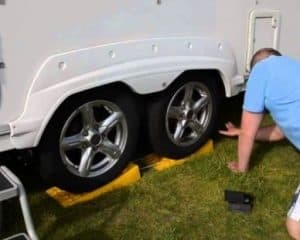 When I wrote my post about how to level a caravan I also talked about levelling ramps and the importance of purchasing quality ramps. However, I’m going to put even more emphasis on purchasing good quality levelling ramps for motorhome owners. And again the reason is weight. I’ve seen many motorhomes in the past with levelling ramps which are broken or split. The reason being cheap plastic and poor design. Make sure that the levelling ramps you purchase have got a good number of positive reviews from customers who have used the ramps multiple times. Even the cheap ramps won’t break the first time you use them (probably). However, you will want to be using these ramps time and time again. 3. Kick the Ramps into Position and Don’t Hold Them! As the video above notes, when you are driving the motorhome up onto the levelling ramps no one should be holding them into position, it can be seriously dangerous. You simply want to kick the ramps firmly into position, parallel to the tyres. To drive up onto the ramps it requires feathering the clutch. Depending on the condition of your clutch this will either be a smooth operation or pretty juddery. The last thing you want is a loved one suddenly trapped under the wheels of your motorhome due to clutch slip! But Why Do You Need To Level Your Motorhome? Well, there are several reasons why it’s a good idea to level your motorhome. First, a level fridge is a happy fridge. 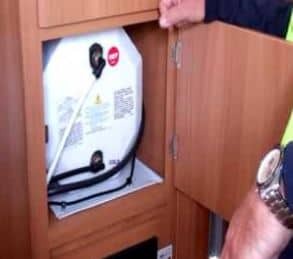 Some makes and models of fridges fitted to motorhomes do not work properly if tilted. Another reason is so your shower drains properly. Now some motorhome manufacturers are wise to the issue of levelling motorhomes. It’s not an easy task for some people, so they now design the shower around the issue. This involves putting two drain holes into the shower floor. However, if your shower only has one drain you want to make sure that it’s going to work properly. Hence levelling the motorhome is vital for those with one shower drain. There is also the issue of a comfortable sleeping environment. Its unlikely your pitch would be so tilted you’re going to fall out of bed. However, some people will notice the difference if their bed is not level in the quality of their sleep. Finally, there is the issue of cooking on your hob. If your not on a stable/level pitch that could make cooking pretty dangerous, especially with hot liquids. 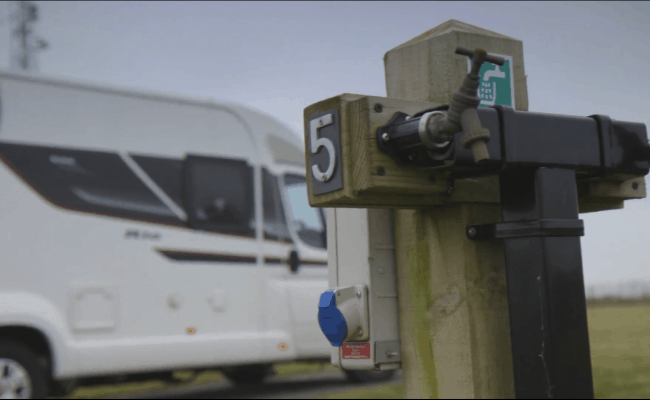 What about Automated Self-Levelling Systems for Motorhomes? Now, these automated self-levelling systems are very impressive. Literally, with the touch of one button, it will do the job for you. However, they are pretty expensive. One visitor to our site told me the self-levelling system for their motorhome cost £7,000. Now, that’s not an insignificant amount of money. However, for them, it was worth every penny. Their mobility was limited and not having the get down on the ground to position ramps etc was important to them. Before you start to level the caravan you want to make sure the van is in a position that you will be happy with for your stay. 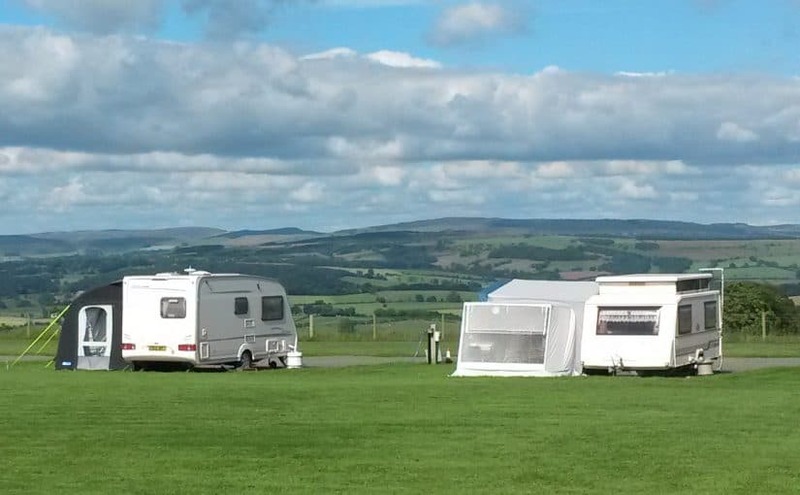 If its a fully serviced pitch you want to make sure the position of the caravan means you can make full use of all the facilities. First, you will need to level the caravan axel, this will probably involve using a ramp on one side. Though other options are available. Now using the jockey wheel you can level the caravan front to back. Once complete its time to lower the corner steadies to hold the caravan into position. 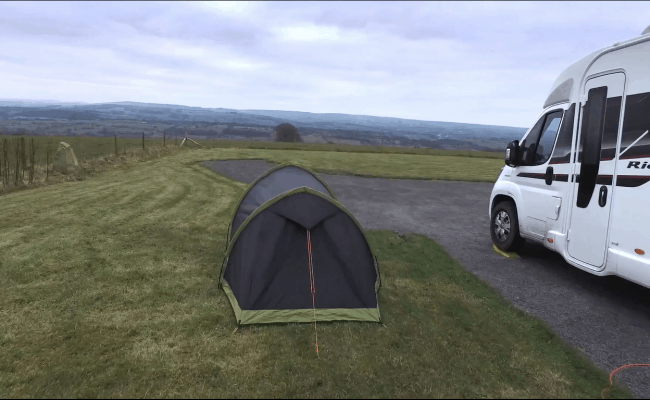 So now we have covered the highlights lets go into a bit more detail on how to level a caravan and the various steps involved. So as stated above, this obviously depends on what sort of site you are visiting. It may be a grass only site where the owners haven’t set out specific pitches. If that’s the case make sure you are far enough away from any caravans or tents nearby for fire regulations, which are usually 6m. Also, if you want to set up an awning make sure there is enough distance between units once that’s been put up. 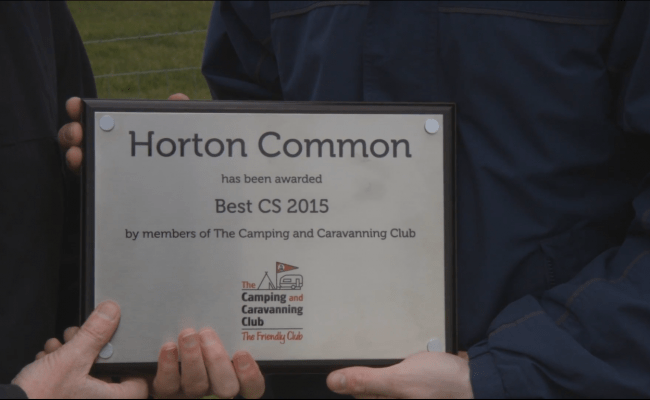 At Horton Common, we provide hard standing fully serviced pitches, with a number for each pitch. Therefore the position of the caravan is set to provide each of our visitors with a good view and access to a 16A electrical hook up, fresh mains water and our wastewater disposal system. The pitches, however, are not perfectly level. In fact, the slight slope is why the wastewater drainage system works so well. Therefore you will need to level your caravan when you arrive. Now that you have the caravan in a good position, we need to focus upon levelling the axel. This is also known as levelling the caravan right to left. But before we do that, we better talk about tools to help you level up and where to place them. So obviously as you might have guessed, a spirit level is the go-to tool here. Now you can purchase a very cheap short spirit level for just a few pounds, however, you might consider other options. For instance, a long spirit level may provide a better reading. There are also cross spirit levels so you can check both directions at the same time. 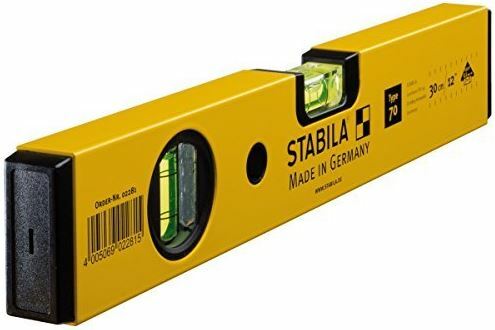 I probably wouldn’t advise purchasing the cheapest spirit level you can find. As strange as this sounds some spirit levels don’t actually show level properly. I’ve had some very cheap ones in the past which give inaccurate results. Furthermore, the plastic was so brittle it got damaged pretty easily. You can even use your smartphone to level your caravan! Now, you can get applications for your smartphone which will tell you where level is. They will even shout it out to you! They work using the gyroscope which is within most smartphones. You could use this option, however always think of the downsides. For instance, if the app stopped working or you need to charge your phone. Therefore I think its always a good idea to have the low-tech option available as well. However, if you are on your own levelling a caravan, having that audible feedback can be handy. Where Should You Place The Spirit Level? Right, there is not a simple one fits all answer to this question, as it depends on the caravan in question. Ideally, you want to place it on the floor of the caravan. But don’t place it upon the carpet or on any lumps and bumps such as floor trims. You want it to have full contact with the floor and be stable. When you come to level front to back you can place the spirit level on the bottom of the door sill. What about putting the spirit level on top of the kitchen worktop? This would seem an obvious option, as it’s nice and flat, and at a height which is easier to see. 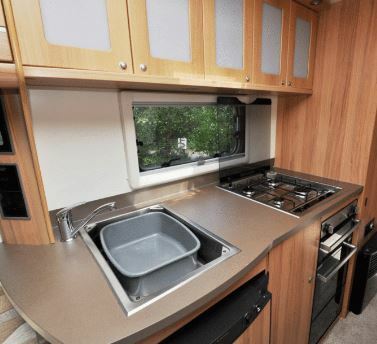 However, sometimes the kitchen worktop is not actually perfectly level to the floor of the caravan. Therefore, don’t presume that it is. 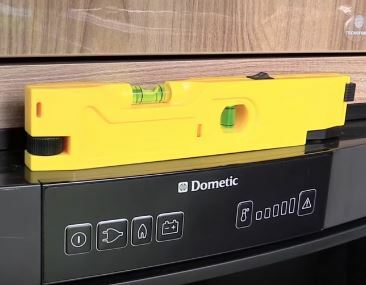 Once you have finished levelling the caravan for the first time you can put the spirit level on the worktop again to check. If it also produces a level result in left-right and back-front you can use the kitchen worktop to level the caravan in the future. 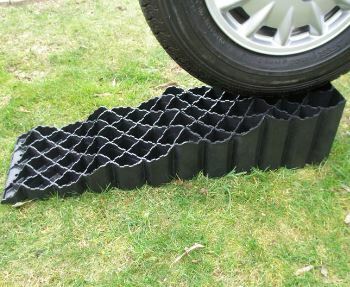 One of the simplest options to level a caravan axel is to purchase plastic levelling ramps. There are various different options on the market. So as normal, read some reviews to see which are the easiest to use and most durable. Also, ideally you don’t want to reverse onto the ramps due to the over-run brake system fitted to caravans. You would position the ramp in front of the wheel, and pull the caravan up onto the ramp. Or you could use a motormover. 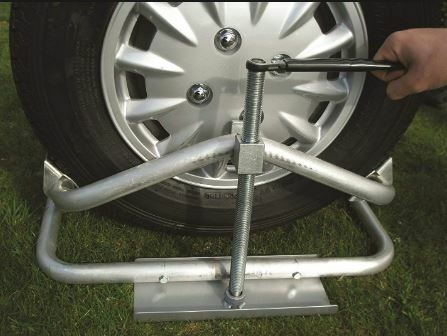 Instead of using a ramp there are wheel jacks available which fit around the wheel. As you turn the handle the wheel will slowly lift up. Again, read reviews before making a purchase. The downsides to these systems are corrosion on the threads can make the jack difficult to use. Also, build quality on some of these products is not the best. Now that the caravan is level across its axel, that’s half the job done. We now need to level the caravan from front to back. We do this by using the jockey wheel. First place the spirit level on the bottom of the door sill, or a suitable location of your choice. Now lift whichever edge of the spirit level gets the bubble into the centre. That will then tell you if you need to go down or up with the jockey wheel. Once you have the bubble in the centre we now have a caravan that’s level right to left and front to back! Now, before you jump inside the caravan with joy, a final important set needs to be completed. You will need to lower each of the four corner steadies to the ground to make the caravan stable. You’ll probably also want to place blocks of wood/bricks underneath the corner steadies feet to stop them sinking. Lowering the corner steadies can be done manually with the included tool, or you can use a battery drill with attachment. However, don’t over tighten the steadies, just make sure they have good firm contact with the ground. Important! Never Use Corner Steadies To Level a Caravan! It may seem tempting to try and use the corner steadies to level the caravan, however, doing so could lead to regrets. Often the corner steadies are fitted to the floor of the caravan, and not the chassis. Therefore trying the lift the caravan to level the unit could bend the floor itself, leading to serious damage. It can also create flex in the caravan body which later leads to water leaks! So, over the last couple of decades, motor movers have completely changed how many people position their caravan. Therefore, it stands to reason that how you level a caravan will also get some attention in terms of caravan modifications. And it has, there are several automated caravan levelling systems on the market now. Using hydraulic or air systems a ram lifts one side and using an onboard gyroscope, they can level your caravan with a push of a button. The most advanced kits also feature motorised corner steadies. So once the caravan has been levelled the corner steadies are also automatically lowered into position. Automated levelling systems are very clever and can do the job within a minute! However, there are also pretty expensive. Currently, you will be looking to spend close to £3,000 to have a kit fitted. However, there are those with limited mobility where such a levelling system may mean they can keep caravanning. But Why is it Important to Level a Caravan? So let’s dismiss the extremes of sliding out of bed because your caravan is not level. The main two reasons to level a caravan are for your shower and your fridge to work properly. For your fridge compressor to work efficiently and in some cases at all, it needs to be level. Secondly, if your caravan is not level and you have a shower you may get a nasty surprise. 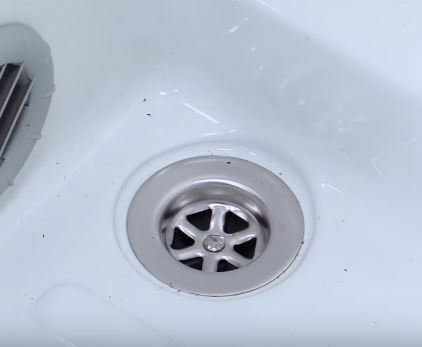 Instead of the water running down the drain, it may just run onto the floor of your caravan! So, first and foremost, get your self a spirit level you can trust. In fact, it’s often a good idea to have a couple of them around the caravan. As they are easy to lose and then not available when you need one. 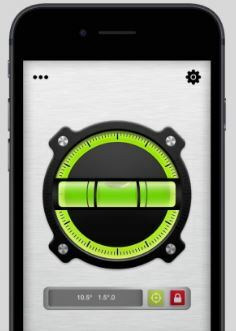 Phone apps for levelling can also be a backup plan or first port of call. Once you have levelled a caravan a couple of times you develop your own chosen means, and it becomes quicker to do. I’ve also written a post on how to level a motorhome or campervan. Anyway, I hope you found the above useful and you consider coming to visit us at Horton Common as some point. Cheers! 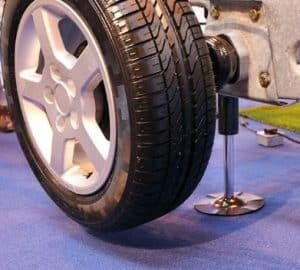 If its a hardstanding pitch make sure both wheels of the axel are supported. For a fully serviced pitch make sure you are close enough to the mains water and wastewater connections. First, make sure the axel is level, you may need to drive one side up on levelling ramps. Release the stabiliser, apply the handbrake and then lower the jockey wheel and lock into position. Then pull the hitch head leaver while using the jockey while to raise the caravan from the tow ball. 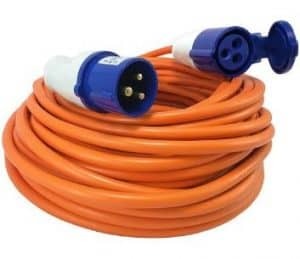 Disconnect the electrics and breakaway cable before moving your vehicle. Then use the jockey wheel to level the caravan front to back. Now the caravan is level you want to lower the corner steadies to fix the caravan into position. If the surface is soft you may wish to put pieces of wood under the corners steadies. You can now enter the caravan. Connect up the mains power cable, checking the RCD switch is working correctly. Turn on the fridge, selecting the mains power option. You then want to sort out the fresh water connection and pump. Then get the toilet cassette ready with the chemical additive. You then want to turn on the gas. Once the water system is working you want to use either the mains electricity or gas for the hot water heater. Then you’re done! Now we have covered the highlights of how to set up a caravan on site lets go into a bit more detail on the points above. 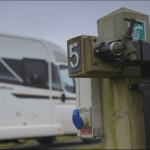 So depending on the caravan site, you may have an assigned pitch number or you may be able to position the caravan where you see fit. You want to make sure that the position of the caravan is going to be suitable so you can level the van. Also if its a fully serviced pitch you want to make sure you are close enough to the facilities to properly use them. Reversing the Caravan or Using a Motor Mover to Set Up? 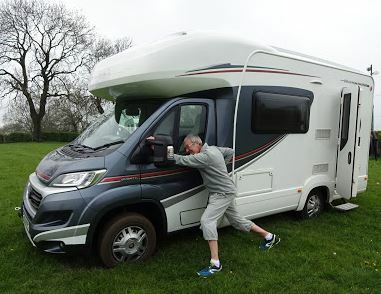 Now, for those who are not familiar with caravanning (and even for some of those that are), reversing a caravan can be challenging. If that’s the case you may wish to consider getting a caravan mover kit fitted. 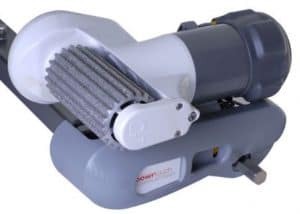 Small electric motors along with drive wheels which are put in contact with the caravan towing wheels can be used to position the caravan for you. After you have lowered the jockey wheel on the caravan and engaged the kit using a remote control you can move the caravan. You have precise control of the caravan, and it makes positioning a lot easier than with the car or pushing the caravan. I would estimate that around 50% of our visitors to Horton Common have motor movers fitted to their caravans. So once you have chosen your position for the caravan, you need to start thinking about how to level the caravan. The process for levelling a motorhome is slightly different. There is a couple of reasons its important to level a caravan on site. First for your fridge to work effectively it needs to be level. Secondly, it’s important for your shower to drain properly, and not leak onto the floor. Don’t just try to level the caravan by eye, purchase a spirit level, even a cheap one will do. However, there are more advanced levels that can show both levelling directions at the same time, and those with other features. First, you want to make sure the axel of the caravan is level, therefore this may involve driving the caravan up on rams on one side. There are levelling ramps you can purchase with small steps. IMPORTANT: Don’t ever be tempted to try and lift the caravan with the corner steadies. 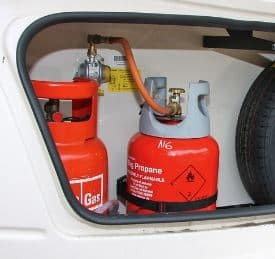 They are not designed for jacking purposes and will create flex in the caravan chassis that could lead to some serious damage and even future leaks. Once the axel is level you can now focus on uncoupling the caravan from the car. You want to release the stabiliser (if you have one), apply the handbrake, lower the jockey wheel and lock into position. You can then disconnect the electrics from the car and breakaway cable. Then lift the hitch lever while simultaneously raising the caravan with the jockey wheel. Once free from the vehicle you can then drive your car away from the caravan and park up. So we now have a caravan level in one direction (along with the axel) and we are free from the car. We can now use the jockey wheel to level the caravan front to back. 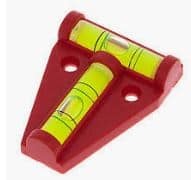 Quick Tip: A spirit level placed on a flat surface on the windowsill which can be seen through the front window can be useful when trying to level the caravan front to back with the jockey wheel. 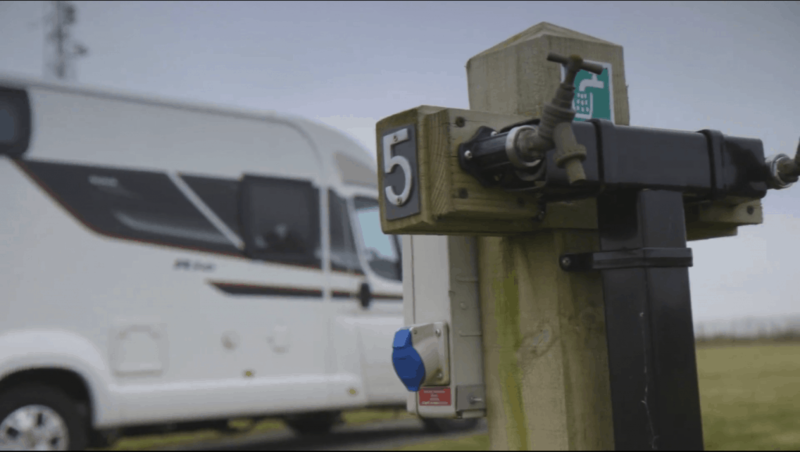 If the sound of levelling a caravan sounds a tricky task, or you just don’t want to be down on your hands and knees with corner steadies, then you could consider a self-levelling system. These use a hydraulic system along with a gyroscope to level your caravan with literally the push of one button. It’s quite a fancy piece of kit (and not cheap). But if you’re not as mobile as you once were, self-levelling kits or levelling a caravan sounds too daunting, they could be a good idea for you. Now that the caravan is properly level you want to lower the corner steadies to the ground to fix the caravan into position. Remember, do not enter the caravan until the corner steadies are down or you will be entering a seesaw! 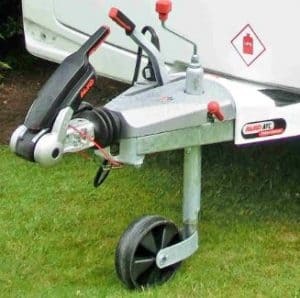 Your caravan should be equipped with a corner steadies winder tool. However quite a few of our guests to Horton Common use a battery drill to do the job. If the surface underneath the corner steadies is soft ground its a good idea to place some pads first. Otherwise, after some rain, you may find the caravan is not as stable as it was when you first set it up. We now have a level caravan firmly fixed into a stable position. 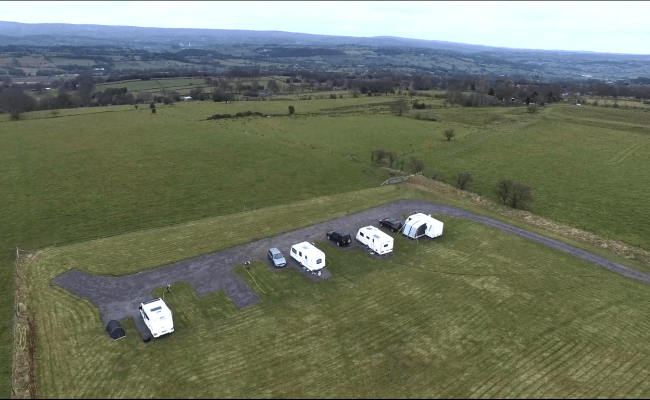 The final part of how to set up a caravan on site is to connect up to the onsite facilities and turn on the facilities within the caravan. 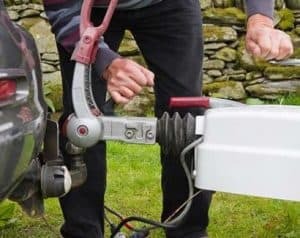 First, connect the mains power cable to your caravan, the connection point is normally in the 12V battery compartment. Then connect up the cable to the pitches hook up point. Once the cable is connected at both ends to can turn on the RCD switch and the power isolation switch on your caravan. You may also have a control panel within the caravan where you need to select mains power over the 12V battery. You will need to go and fill up your Aquaroll from the mains water supply on site. Or, if you are on a fully serviced pitch setting up your mains water adapter kit from the tap to your Aquaroll. 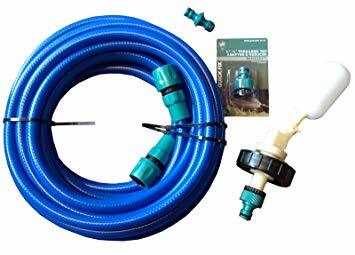 You will then need to connect up the pump and pipe from the Aquaroll to your caravan. 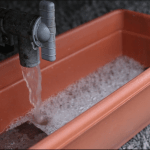 Once the water system is primed and sterilised you can now set up the hot water system. It’s VERY important that the hot water system is full of water before you turn it on. Otherwise, this could damage the hot water system, potentially irreparably. The hot water system can normally run off either gas or mains electrical power. If your going to run it off the gas make sure the outside cover is removed from the heater exhaust. 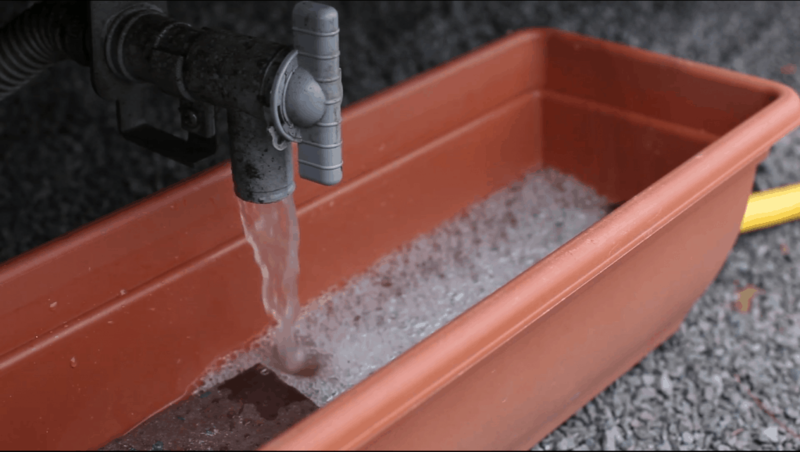 Now before you use the water system within the caravan for the first time you need to set up the wastewater collector. Another name for a wastewater collector is a Wastemaster which is a product brand. You will need to fit the Y drain piece and pipes into the Wastemaster. Make sure it’s lying flat and stable under the caravan. Quick Tip: Ask the site owner where they would like you to empty the wastewater. It will often be at the side of a hedge etc. Don’t presume to empty it into the Chemical Disposal Point (CDP). If you’re visiting a fully serviced pitch such as those here at Horton Common, we provide the wastewater removal for you. 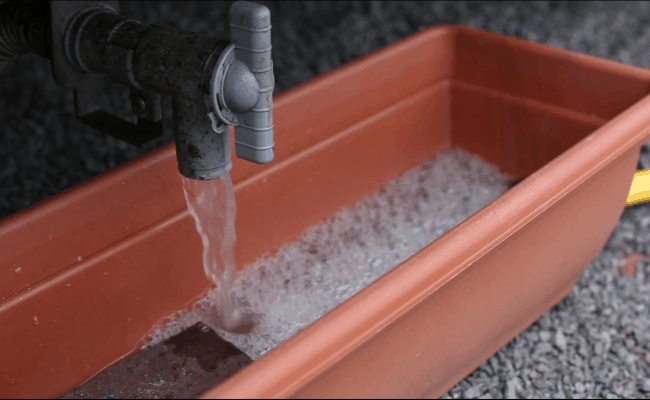 So you can leave the wastewater collector at home. It also saves space in the caravan. 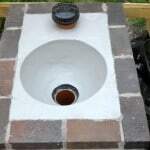 You simply position the wastewater collection trough under the caravan waste outlets and that it! 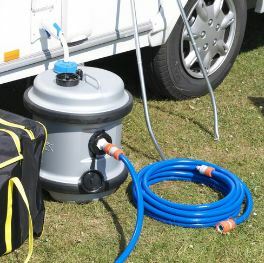 It has a large diameter hose which connects the trough the land drain on the caravan site. You’re nearly there now and you can start to enjoy your holiday! So finally you need to set up your toilet cassette. 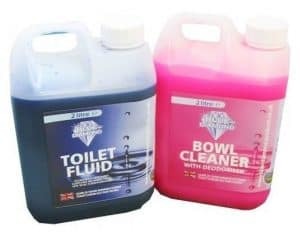 Before you set off on your trip you need to have purchased some blue and some pink toilet chemicals. The blue chemical goes into the toilet cassette and the pink chemical goes into the flush tank. I’m not going to go into more detail here on how much to use, its best to read the instructions on the back of the bottle. You should also check out the instructions on how to properly operate your toilet cassette from the manufacturer. 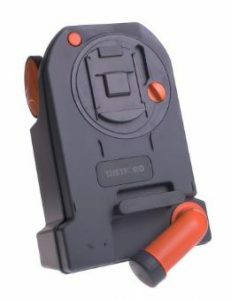 Most toilet cassettes are made by Thetford. There are many different brands of toilet chemicals, and some do a better job than others. As with most things, you frequently won’t get adequate solutions buying the cheapest products so bear that in mind. Best to do a bit of research and read some reviews before making your choice on which products to use. If it’s not obvious, ask the site owner when you arrive where the CDP is located. Another quick tip is to take your time when emptying the toilet cassette to avoid any nasty surprises. There should be a water supply next to the CDP so you can rinse out the cassette once empty. Before you put in the blue chemical again the instructions normally state to put in a small amount of water into the cassette.